It’s cold outside, so stay in where it’s warm and learn something new! We’ve rounded up 17 free non-profit webinars for March on topics such as: Engaging Volunteers of the Future, the Secrets of SEO for Nonprofits, How to Build a Rockin' Major Gifts Program and much more. 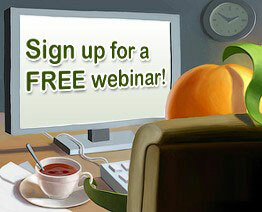 Check out the list of free webinars below and share these with your non-profit colleagues. If we’ve missed a webinar, add a brief note in the comments below. In our upcoming Wild Apricot Expert Webinar, Allison Fine will outline a new kind of leadership that generates the courage to be out in the world in more open and vulnerable ways by knowing that other people truly matter and trusting that the world will respond with good will, creativity, and generosity. Leading this way doesn’t mean doing something different, it means being something different. Learn how to engage your board in fundraising. This Grant Space webinar helps you think through the process of getting your board involved with fundraising. The age of one-size fits all volunteer engagement is coming to an end. This VolunteerMatch webinar will start with a review of some of the things that we know about what volunteers are looking for in an opportunity. It will then help you use this information to start designing volunteer opportunities and determining who is the “right” volunteer for your program. You’ll also learn how “word of mouth” plays such a large role in attracting volunteers to your organization and how social media makes this even more important. What do you want philanthropy to look like in your organization? This 4Good webinar will discuss and help you establish a framework for getting others on board the philanthropy bandwagon - you don't have to do it alone! This CharityVillage webinar presents ‘ease-y’ solutions for the busy nonprofit professional - including Executive Directors. The session will introduce a little neuroscience-backed brain savvy with simple strategies that help us work with our brain, not against it. As well Charity Villiage will highlight simple habits and strategies that can indeed help us more successfully navigate stressful times with more ease and success. This webinar is ideal for busy nonprofit professionals at any stage in their career who feel overwhelmed with their day-to-day workload. It may be of particular interest to executive directors of small organizations. Are you engaging volunteers with an eye to the future? Do you know what your volunteer program should look like in 3 or 5 years? Join VolunteerMatch as we talk about the fundamentals for creating a strategic plan for volunteer engagement for your organizations. This webinar will include components that should be included as well as ideas for working with organization leaders to include strategic goals for volunteer engagement in your organization's overall strategic plan. Is your organization open to engaging volunteers in new ways? Often one of the biggest challenges to a new model of volunteer engagement is the resistance of paid staff. Often attitudes and fears of our co-workers prevent us from expanding the work that volunteers do. But, if you've never worked with volunteers before, it can be scary. In this VolunteerMatch webinar we'll discuss strategies for working with paid staff to engage volunteers. VolunteerMatch will cover what you can do to alleviate some of those fears, strategies for working within a Union environment, and how you can train and support your coworkers as they become responsible for managing volunteers. If you are experiencing a disconnect between what your board is doing and what you expect — communication changes can make a big difference. The key is to make the tasks fun and simple and to provide clear direction and guidance. The difference between fundraising and development. When to start talking about fundraising with board members. Seven ways board members can be involved in fund development and NOT have to ask for money. What to measure & how to share activity updates that cause deeper engagement from your board members. Family Power: Can Your Organization Benefit from Engaging Family Volunteers? Family volunteering inspires all members of a family to use their skills, time, and passions to help make the world a better place. While many organizations regularly welcome families as members, visitors, and clients, rarely do those organizations welcome families as volunteers. Research shows that engaging families as volunteers not only helps to address today’s needs, but it actively builds for the future, helping to nurture tomorrow’s volunteers and leaders. In this VolunteerMatch webinar, join Beth Steinhorn to explore what family volunteering is, hear case studies of successful models for engaging family volunteers, understand the benefits of family volunteering, and receive tips on how to determine whether family volunteering is right for your organization. What family volunteering is, and successful models for engaging families in volunteer activities. The benefits of family volunteering. Tips and strategies for successfully engaging family volunteers. In the early days of social media, most people jumped in and tried to figure it out for themselves, usually by posting anything and everything. Now many organizations dedicate massive budgets to sophisticated campaigns, an approach that's beyond the reach of most small nonprofits. But just because you don't have a big budget doesn't mean you can't be strategically savvy about how you use social media. This Idealware webinar will review a few low-cost, low-stress tips and tools that can help you take your social media efforts to the next level. It's important to create a culture of inclusion and engagement of volunteers within your organization. But, it can be hard to recognize what your current culture says to volunteers, or identify how to make changes to help volunteers feel more welcome. This VolunteerMatch webinar will help you identify how your organization's current culture is shaping or limiting what volunteers do, and provide steps you can take to start to create more understanding, respect, and appreciation for engaging volunteers. real-world examples of how nonprofits are succeeding with online fundraising. There is huge potential for impact when you connect your organization to individuals with the capacity to make a significant gift. This Nonprofit Hub webinar will outline 7 steps you can take to start (or improve!) a successful major gifts program. You’ll learn how to plan and prepare, what to say during a solicitation visit, and how to follow up to maximize donor cultivation and stewardship. Professional volunteers are volunteers who work on projects that require specific expertise, usually related to the management of a nonprofit organization. Professional volunteers might assist an organization with human resources, marketing, strategy or other high-level projects. Why become a professional volunteer? The reasons are many - you might want to: build your resume, learn new skills, stretch intellectually, apply your education in a new industry, and/or volunteer your time without being stuck with mundane tasks. This CharityVillage webinar is ideal for those new to the concept of professional volunteering. It may be of particular interest to new graduates and those with corporate experience looking to break into the nonprofit sector. If your organization offers a free webinar that would be of interest to non-profit, membership, or volunteer-based organizations and you want to include it in next month's post, please email a brief overview (like those above) to lori@wildapricot.com no later than March 18th. Sorry for the error Jennifer. I've revised the listing. Good luck with the webinar!